Quite a number of people were revolted watching the manner in which Brett Kavanaugh so self-righteously behaved as though victimized by having to defend himself against allegations made by Christine Blasey-Ford. From all accounts, he went to a prestigious prep school, and seemed groomed to live and work within the upper echelons of society. How outrageous, thought he, that he was placed under scrutiny by the FBI and the Senate Judiciary Committee. How dare he be questioned at all? And then there was the Stanford athlete, Brock Turner, who had been accused of sexual assault on Stanford’s campus. Turner was convicted of three charges of felony sexual assault. Santa Clara County Superior Court Judge Aaron Persky sentenced Turner to six months confinement (of which he served half) and three years probation. Seeing his father so affronted on the news at the prospect of his son being punished was pretty striking. How is it that a man accused of sexual assault turns into a victim? What is it that allows that process to happen? These are two examples of people who feel very entitled to be given whatever they want, because they seem to have grown up believing they deserve it, and nothing should stand in their way. whom they associate. They require excessive admiration; their self-esteem is almost invariably very fragile. A sense of entitlement is evident in these individuals’ unreasonable expectation of especially favorable treatment. They expect to be catered to and are puzzled or furious when this does not happen. Individuals with NPD generally have a lack of empathy and have difficulty recognizing the desires, subjective experiences, and feelings of others. They are often contemptuous and impatient with others who talk about their own problems or concerns. Arrogant, haughty behaviors characterize these individuals: they often display snobbish, disdainful, or patronizing attitudes. Although they may not show it outwardly, criticism may haunt these individuals and may leave them humiliated, degraded, hollow, and empty. They may react with disdain, rage, or defiant counterattack. 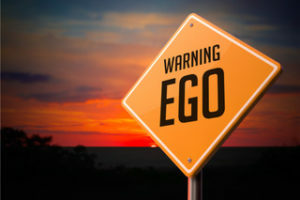 It is interesting to note that those who live and work with them often feel exhausted, exploited, as though they must walk on eggshells, and never authentically connecting. We know of at least one very obvious example, though I won’t mention his name. He speaks to others in an offensive tone, often blaming someone else, and when confronted with his words, deflects what is asked of him and then retaliates. According to Freud, it is thought that all human infants pass through a phase of primary narcissism, in which they assume they are the center of the universe. This phase ends when the baby is forced by the realities of life to recognize that it does not control its parents or other caregivers but is in fact entirely dependent on them. Normally, the baby (at between 15-22 months) gives up its fantasy of being all powerful and becomes emotionally attached to its parents rather than itself. What happens for the NPD patient is that the fantasy persists that the world is his oyster and revolves around him. In order to protect this illusion, he must seal off those perceptions of reality that do not fit or resonate with this grandiose self. The psychiatrist Kernberg views narcissism as a child’s defense against a cold and unempathic parent. Emotionally hungry and angry at the depriving parents, the child withdraws into a part of the self that the parents’ value, whether looks, intellectual ability, or some other skill or talent. This part of the self becomes hyper-inflated or grandiose. Any perceived weaknesses are split off into a hidden part of the self. Splitting gives rise to a lifelong tendency to swing between extremes of grandiosity and feelings of emptiness and worthlessness. Additionally, a person with NPD frequently externalizes what s/he cannot allow themselves to feel.